It's RAM Power Days at Melloy Dodge and the best time to get a great price on the 2017 RAM 1500 Lone Star Silver. If you've always wanted an ultra-comfortable truck that will do anything you need it to do, stop by our showroom to test drive the Lone Star Silver. Convenience features include an auto-dimming rearview mirror, illuminated entry, front dual zone air conditioning and automatic temperature control, all of which make driving a pleasure. The garage door transmitter makes it convenient to drive right in the garage, especially in inclement weather. Remote keyless entry means that you don't have to empty your hands just to unlock the doors. For those who work in their vehicles or travel a lot, the 8.4-inch primary LCD screen, radio data system, and Uconnect with Bluetooth make life easier. You'll also enjoy audio controls mounted on the steering wheel. For long trips, the power two-way driver lumbar support keeps you comfortable. The 2017 RAM Lone Star Silver features a 5.7-liter V-8 engine with 395 horsepower and 410 foot-pounds of torque. It tows up to 8,040 pounds and has a payload capacity of 1,510 pounds. Safety and security features include a security system, perimeter lights, a panic alarm, several airbags, four-wheel ABS disc brakes, electronic stability control and traction control. Additional features include fully automatic headlights so you won't have to remember to turn them on in the rain, delay off headlights to allow you to get inside without fumbling in the dark and front and rear parking sensors. 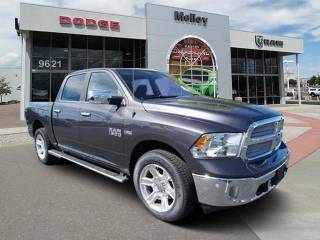 Stop by Melloy Dodge today to test drive the 2017 RAM 1500 Lone Star Silver or check out our selection of other RAM trucks during RAM Power Days.